Phewf, we've had a long dry spell but we have still been cooking and are ready to rev things up. This proved to be a quick and tasty after-work-meal. That means little prep and a short cook time! 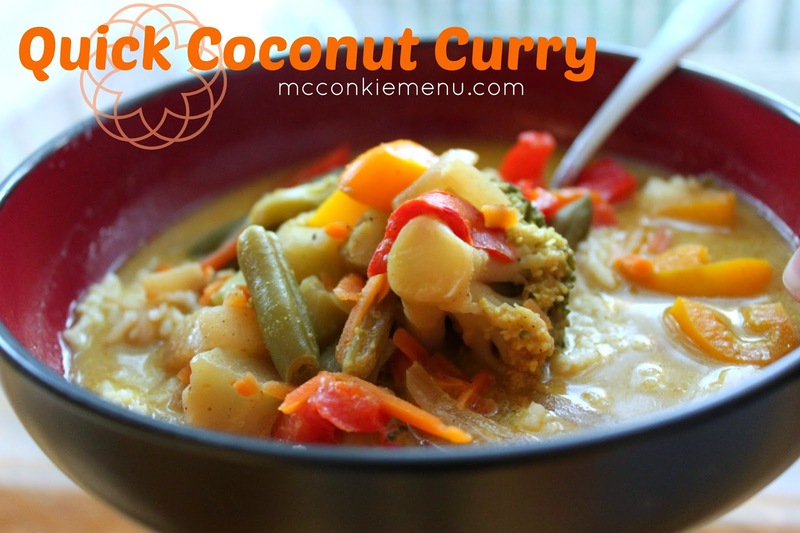 This mild coconut curry with just a very small kick of spice will please a crowd. We also quickly fried up and added a few mini sweet peppers to beef it up a bit. Add coconut oil and garlic to pan over medium heat. Once oil is melted add mixed veggies and fry for 2-3 minutes. You might need to fry for a few more minutes if veggies are frozen. Add ginger, curry powder, Cayenne, vegetable stock, coconut milk, salt and pepper. Bring to a simmer then reduce heat slightly and cook for 10-15 minutes or until curry is hot and vegetables are tender. Once the curry is simmering, add all coconut rice ingredients to a rice cooker (making sure to rinse your rice first). For more details about how to make coconut rice without a rice cooker see our post here - however, a rice cooker is totally worth it, especially if you are looking to make quick meals! Serve curry over coconut rice (or quinoa) and top with coconut flakes and fresh cilantro.